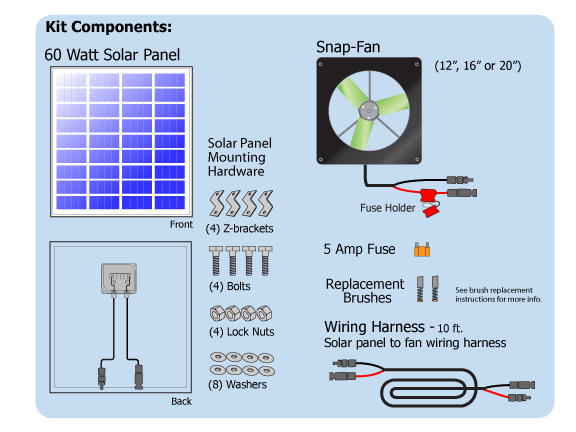 The 16" DC Snap-Fan Solar Fan Kit includes everything you need to get your ventilation system started. With the easy snap together MC connectors there's no splicing wire, making installation a BREEZE! Recommended for small greenhouse sizes 10' x 12' x 9' up to 10' x 16' x 9'. Giving your greenhouse one air exchange per minute for optimum plant health and growth. Our engineers have designed this system to create a simple, easy to install and use solar ventilation system. Snap-Fan solar DC ventilation fans wire directly to the solar panel. No need for batteries or charge controllers. Simply mount your Snap-Fan and solar panel in the desired location, run the solar PV cable and snap the MC connectors together. The fans speed will vary depending on the amount of power being produced by the solar panel. In full sun the fan receives a high amount of power from the solar panel, giving your greenhouse the full cooling effect. If a cloud blocks the light from the sun, the fan will slow down but your greenhouse will also be in the shade therefore not needing as much cooling. Make the sun work for you! For all other parts inquiries, please submit a parts request form.